Participants at the previous Baha Mar event. Nassau, Bahamas - After three very successful events at the National Tennis Centre, Albany Tennis Academy and Baha Mar in New Providence the Winterbotham IC Junior Series moves to Freeport on this weekend November 3rd & 4th. 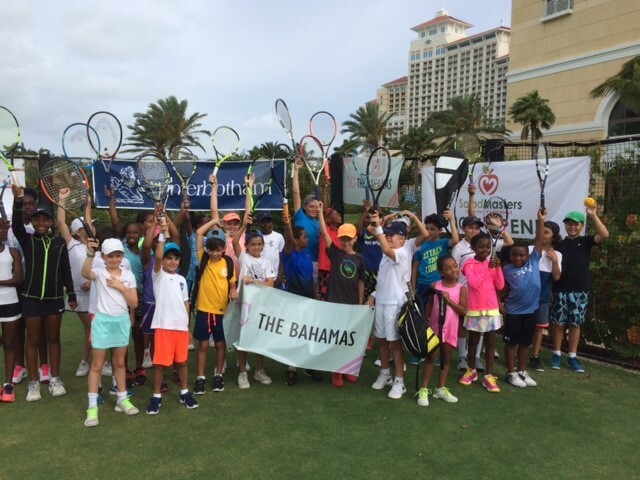 This tennis series designed for the important development ages of 10’s and 12’s is organised by the IC of The Bahamas ( part of 40 International Tennis Clubs comprised of top players who also give back to the development of their sport). Different to many straight knock out events The Winterbotham IC Series is played on a round robin basis over just one weekend using a short set format. For the 10 & under group special slower soft balls are used. So there is plenty of action and no-one is eliminated early. The juniors are given lunch and talked to about the IC motto of “Hands across the net, friendship across the ocean”. The talks also emphasise that the series is about development and creating a group of tennis friends who can progress together for the overall benefit of everyone and Bahamian tennis. So it is more than about winning. Sportsmanship awards are given in memory of popular Bahamian tennis player Charlie Farrington whose grandson has been playing in the series. This event is being held on the Y.M.C.A courts at Freeport and has attracted good participation from there. In addition several Nassau based players are making the trip too. This includes Patrick Mactaggart whose father Neil Mactaggart ( IC Vice President) is a prime initiator of this series and will be there to help oversee the event. The event is being staged by the IC of The Bahamas together with The Grand Bahama Tennis Association which the IC is pleased to be working with to expand beyond New Providence. IC President Kit Spencer thanks both Winterbotham Trust and its President Ivan Hooper who have made this popular series possible and Grand Bahama Tennis Association for helping to expand to Freeport. So this gives another group of juniors the possibility to benefit from these popular events.